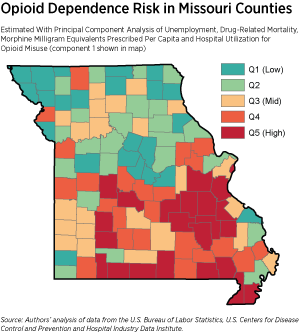 New research on the cost of the opioid crisis finds Missouri’s economic burden of lost lives and societal costs was $14 billion in 2017 — 20th highest among the states. The opioid use disorder problem exists in all parts of the state. However, many rural areas are at significantly higher risk for opioid dependence. Fortunately, new federal and state resources are being directed at the crisis to reduce the risk of dependence, assist with nonopioid pain management and support recovery. Missouri’s Medicaid program, MO HealthNet, has announced enrollees will have access to acupuncture, chiropractic therapy, physical therapy and cognitive behavioral therapy for chronic pain diagnoses. These approaches to pain management will reduce the risk of addiction and abuse, and represent a significant milestone in the Missouri Department of Social Services’ efforts to address the opioid crisis. At the same time, planning and development grants through the U.S. Department of Health and Human Services’ Health Resources and Services Administration are building communities’ capacity to address the opioid crisis locally. In 2018, 24 Missouri counties were awarded planning grants and now are eligible for three-year, $1 million implementation grants. In addition, new Missouri counties now are eligible for initial planning grants. Many of the communities receiving funding and support correlate with identified high-risk areas. Let’s #ReimagineRuralHealth to address Missouri’s opioid crisis.